We tend to mark milestones. Candles on a cake, a celebration with the flipping of a calendar page to the New Year, anniversaries of deaths and important events are all part of the general consciousness. There has been a shift here after Daniel Bradford’s sale of All About Beer Magazine and our World Beer Festivals to Chris Rice, who was our longtime vice president. Bradford will remain with us as associate publisher. As a man who has been with the industry for nearly 40 years, he will continue to provide insight, history and new ideas to keep the magazine humming along. Rice, a man of good character and smart ambition, is ready to lead the company into the next era, and all of us here are excited to be a part of it. Read Daniel Bradford’s final column for All About Beer Magazine. In this issue Peter Rowe takes us for a ride in the wayback machine through vertical tastings, something the modern brewery age is only now being able to offer drinkers. A chance to see how beers improve (or not) with time and the way brewers are not only thinking about freshness, but also how flavors will evolve with age. Patrick Dawson, the author of Vintage Beer, chimes in with a few tips on starting your own beer cellar. I suspect that aging beer is something we’ll be coming back to again and again in the years to come—especially as that area of the industry evolves. The adage of everything old will be new again applies to Jeff Alworth’s piece on the resurgence of lagers by American brewers. In the 1980s ales came into fashion, but now you’re likely seeing more lagers on shelves, and his piece examines why. We recap the winners from the annual Great American Beer Festival, a tradition that goes back 34 years. Some veterans have taken to calling it “the family reunion” and look forward to the yearly autumn gathering. Before a gathering of a different sort a few months ago, I found myself sitting at a table with Bradford at the Cambridge Brewing Co. in Massachusetts. We were greeted by Will Meyers, the brewmaster, who introduced us to Todd Bellomy, a former Boston Beer Co. employee who is in the process of starting a sake brewery. Intrigued by the venture, in this issue we take a look at some other rice wine producers popping up around the counry. It’s part of our editorial mission to sometimes look beyond beer. The next issue of All About Beer Magazine marks 35 years in this most fascinating of industries, and we’re ready to cover it all. 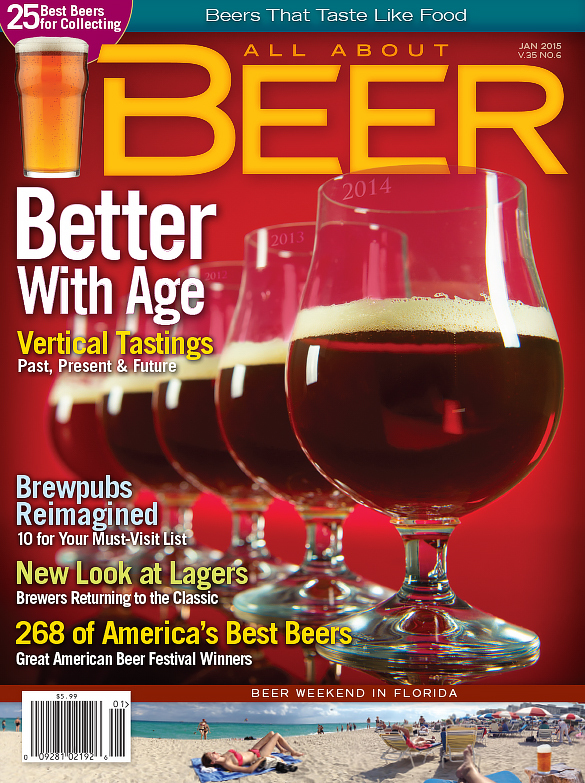 This column appears in the January 2015 issue of All About Beer Magazine. Click here for a free trial of our next issue. John is the editor of All About Beer Magazine and the author of three books, including The American Craft Beer Cookbook. Find him on Twitter @John_Holl.